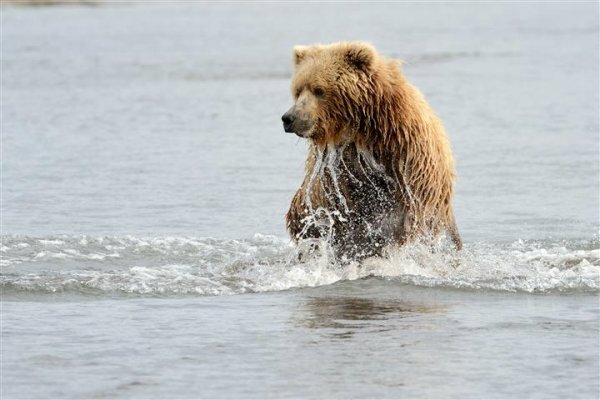 chain: it is the mighty grizzly bear. Arrive at Tweedsmuir Park Lodge and begin your experience with an evening drift on the Atnarko River to look for Grizzly Bears. Relax and enjoy the scenery, but keep your eyes open for wildlife. 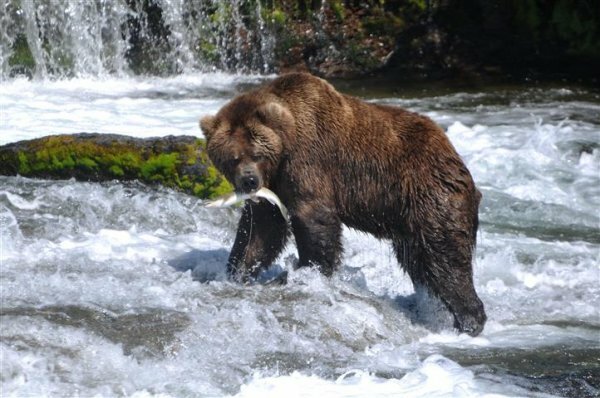 The Salmon are spawning and provide an easy meal for Bald Eagles and Grizzly Bears. River Otters and Black Bears may also be spotted. This day includes another river float trip, with the express purpose of looking for and spending time watching the magnificent Grizzly Bears. Bella Coola is home to the highest concentration of Grizzly Bears in North America. The fall salmon run attracts them and they are busy eating and putting on weight for the coming winter. After a day on the river it is time for a scenic helicopter flight into the alpine and over to Hunlen falls, the third highest waterfall in Canada. There is nothing like an eagle eye view of the Bella Coola valley and its surroundings to make you appreciate the full extent of this wilderness. 3 night itinerary ends - Enjoy a daytime drift on the Atnarko River. You will also enjoy a guided valley tour with short hikes to look for bear signs, such as tracks, salmon carcasses, rub trees with claw and bite marks, as well as places the bears dig out in the forest floor for their naps called day beds. 4 night itinerary ends - We have built in a weather day to the program. If the helicopter sight seeing excursion is not possible on day two, then we would do it on this day. In addition, there would be an opportunity to go for an exploratory hike in Tweedsmuir Park, the biggest park in BC, as well as another evening drift down the Atnarko River for one last opportunity to view and photograph the Grizzly Bears. from the deck before you depart from Tweedsmuir Park Lodge. Special Terms & Conditions apply to this tour which will be advised at the time of booking. Accommodation at the Tweedsmuir Park Lodge / Double Occupancy. All activities described in the itinerary. Applicable taxes and GST rebates.